The AU18 Documentary from @kristianjeff on Vimeo. The 18th ASEF University (AU18) showed how young people can creatively promote sustainable consumption. 42 participants from 33 Asian and European countries joined in the 2-week programme in Tartu, Estonia (August 2012). In this contribution 2 participants and 2 facilitators share their experiences through a written article by Wong Chong Wai Kenneth, a video by Kristian Jeff Agustin and a conversation between Claudia Jazz Haley and Angela Davies, of which six sound bites are embedded in the text. Themed “Conscious Consumers for Environmental Sustainability”, AU18 was composed of a week of academic programme and interactive workshops, and a week of awareness campaign reaching out to residents of Tartu. The campaign kicked-off with a social mapping exercise, where the participants interacted with the local community members to have a better understanding of their consumption patterns. These inputs created the starting point for the messages to be addressed in the different street actions. - Recycling and reusing materials. During the 48 hours after the social mapping, the participants utilised their artistic skills to develop engaging and innovative ways to promote sustainable consumption. 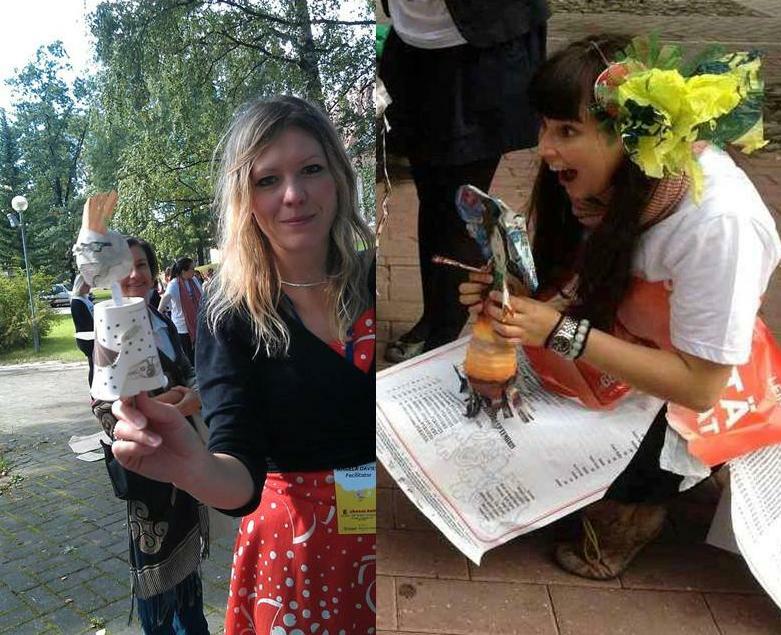 Claudia’s group gave used materials a second life: by-passers made their own puppets and curtains to understand how useful waste can still be. Some participated in interactive games on meat and dairy products while others were challenged by Kristian’s group to pledge a simple “improvement” in their daily consumption. Songs were composed on the environmental impact of the Estonian, European and world purchasing behaviour. Several participants used theatre and living statues to share ideas on how to use electricity, water and transportation better. Another group exchanged people’s plastic bags for reusable ones and created a long chain of plastic bags. Claudia and Angela describe all activities here. The participants also joined in a flash mob to attract the audience’s attention to take their own action to maintain a good quality of life which everyone can enjoy. These actions showed that the challenge of language barrier can be addressed through the use of non-verbal communication, such as theatrical still images and posters with pictorial illustrations. Young Estonian volunteers assisted with the translations. Most importantly, when implementing creative actions on sustainability, one should walk the talk and not be wasteful. Thus, the participants used cardboards, recycled materials, plastic bottles, cans, used paper, magazines, etc., to conceptualise, design and execute the street actions. It was heartening to see that the participants were able to put into practice what they learnt during the workshops. And within such a short time of less than 2 days! They passed their knowledge to the people of Estonia and hopefully this will create a ripple effect to increase the community’s awareness on sustainable consumption. Through AU18 the participants will bring back a better understanding of Asian and European working styles and an appreciation of each other’s cultures. They also improved their knowledge and skills on sustainable consumption and campaigning, as experts and participants shared their views, opinions and ideas openly. The participants hope that the street action examples can be an inspiration for other young people to take action and to choose better. They now form a strong network – both online and offline – that shares this importance with a broader audience. AU18 may have ended, but their journey to promote sustainable consumption has just started! AU18 was co-organised by the Asia-Europe Foundation (ASEF), the University of Tartu (UT) and the Estonian Student Councils’ Union (ESCU) from 18 August to 1 September 2012. This article is written by Wong Chong Wai Kenneth, AU18 facilitator from Singapore. Kenneth is an avid young environmentalist, who has participated in various international environmental conferences. He also serves in various youth organisations such as the National Youth Achievement Award Council and the People’s Association Youth Movement (PAYM). The film is developed by AU18 Philippine participant Kristian Jeff, who is currently based in London (UK). He recently accomplished his Master's degree in Visual Culture at the University of Westminster, London. He obtained his Bachelor's degree in Art Studies at the University of the Philippines, where he co-founded the Circle of Young Artists and served as its Artistic Director. His first poetry collection will be published this year (www.universeandwords.com). Claudia Jazz Haley, AU18 participant from the United Kingdom, is a creative practitioner, street performer, community artist, and Theatre Director. She has been awarded the Renaissance Theatre Arts Fund to pursue her Master studies in Theatre and Performance at The University of Sheffield. Claudia has worked with Little Angel Theatre and Burnley Youth Theatre, and she is the co-founder of The Rokeya Project, a London-based community theatre project. Angela Davies is an AU18 facilitator and a visual artist based in Wales, United Kingdom. She has exhibited on the (inter-) national scale, such as at the International Museum of Collage, Assemblage and Construction. As a creative practitioner, Angela advocates the belief of sharing skills and promoting creativity. Through Cyfuno, Angela is establishing a creative culture within her town promoting localisation and sustainability. She also shares these skills in her role as creative consultant for BBC Education.